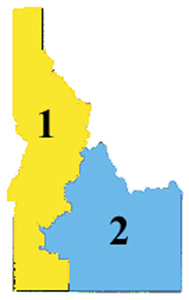 On August 22, 2001, Idaho’s first Commission on Redistricting approved new legislative and congressional district boundaries. The Commission for Reapportionment draws both congressional and legislative districts. The Commission has six members; no member can be an elected or appointed official. Leaders of the two largest parties in the house and the senate appoint one member for a total of four, and the chairpersons of the two parties with the most votes for governor appoint one each. There is no gubernatorial veto power of either plan. The Commission will contract with ten public libraries across the state to provide the same census information and districting software that the Commission will be using to draw its maps. The commission also has a website, which includes maps, and transcripts of hearings . In addition, all meetings of the Commission will be open to the public. The 1992 redistricting plan simply shuffled Boise precincts. Similar modest changes are expected again in 2001-02. There is some concern regarding the short, 90-day, timetable under which the Commission will be working, as well as the fact that there is no fallback position if the Commission fails to meet its deadline. During the last round of redistricting, the Idaho Hispanic Caucus petitioned a state court to create a Hispanic-majority state legislative district in the Canyon County area. However, the court found there were not enough Hispanics in the population in that area to create such a single Hispanic-majority district and dismissed the complaint. In the early 1990s, Idaho established a six-member Commission for Reapportionment. 2001 will be the first year Idaho will have used this method of redistricting. In the 1999-2000 legislature, Senate Bill 1554 proposed to provide that county commissioners’ districts be created by a committee on redistricting. It detailed how to appoint the commission members and implement the district plans, but the measure was defeated in committee. None - One at large district.